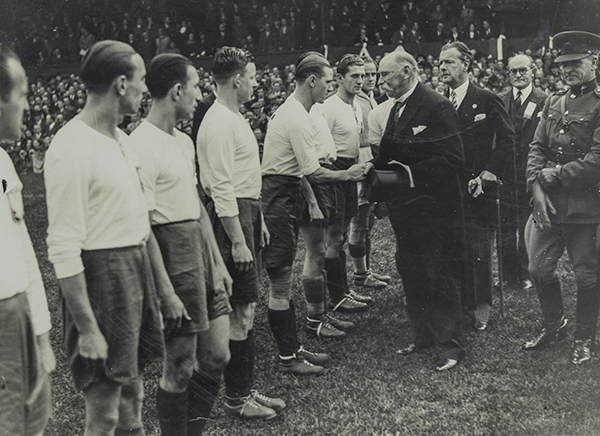 The second leg of the first ever soccer match between Poland and Ireland, which took place in Dublin on 15 November 1938, was attended by the president of Ireland, Douglas Hyde, and Taoiseach Éamon de Valera. The result was a 3–1 win for Ireland. As a result of his attendance, President Hyde was removed as patron of the GAA. At that time, Rule 27, or ‘the ban’, prohibited members of the GAA from playing games or attending functions organised by those promoting ‘foreign’ sports. And then with that charmingly humorous twinkle in the eye, so characteristic of him [he said]: “But listen, I would like to greet your boys in their own language! Could you suggest anything short?” I scribbled two words, Witam, Panów, and handed them over to the President. “How do you pronounce it?”, he asked. “Veetam, Panoov,” I answered. “And the meaning of it?” “Welcome, Gentlemen.” “Splendid, splendid!”, concluded the President. And this is how it happened that on the appointed day there appeared at Dalymount Park the highest authorities of Ireland, represented by the President, by Mr de Valera and two cabinet ministers to officially attend, for the first time, an Association Football match. I followed the President onto the pitch to introduce him to my country’s team. When Dr Hyde came level with the first in the row he said in a clear voice, Witam, Panow! Delighted to be greeted in their own language, the Polish team shouted back in the Polish boy-scouts way Czołem, Panie Prezydencie! [‘We salute you, Mr President!’].